Autoimmune hepatitis is a progressive necroinflammatory process leading to chronic hepatitis or cirrhosis. It is characterized by the presence of circulating autoantibodies and high serum globulin concentrations. The pathogenesis of autoimmune hepatitis is unclear; however, a proposed mechanism suggests overactive T cells in genetically susceptible patients. Autoimmune hepatitis is characterized histologically by certain non-specific findings, making the measurement of autoantibodies and gamma globulins essential for diagnosis. It is also essential to differentiate autoimmune hepatitis from other forms of hepatitis. Autoimmune hepatitis is a form of chronic hepatitis. It is autoimmune in origin and characterized by the presence of circulating auto-antibodies and high serum globulin concentrations. It causes non-specific histological findings as seen by light microscopy, making the detection of auto-antibodies the mainstay for the diagnosis. There are two types of autoimmune hepatitis based on the antibodies found in each. Anti-soluble liver antigen (anti SLA). It is also associated with other autoimmune conditions like pernicious anemia, thyroiditis, celiac disease and Coombs positive haemolytic anemia. In Asians, the condition is associated with HLADR4. In autoimmune hepatitis type II, anti-liver/kidney microsomal antibodies (anti-LKM1) are present. Their main target is cytochrome P4502D6 (CYP2D6) on liver cell plasma membranes. It primarily affects young women but is less common. Autoimmune hepatitis has an annual incidence of approximately 2 and a mean prevalence of 18 per 100,000 population in the Western Europe. It is common in middle-aged persons in their 40s and 50s, although it can occur at any age. Females are 3-4 times more affected than males. The underlying etiology of autoimmune hepatitis is unknown. However, it has been proposed that in a genetically predisposed patient, an environmental agent, perhaps a virus, causes a sequence of T-cell mediated events against liver antigens producing a progressive necroinflammatory process which results in fibrosis and cirrhosis. In vitro observations have shown that there is a defect of suppressor T-cells which may be primary or secondary. However, no clear mechanism causing the inflammation has been found. The clinical presentation of autoimmune hepatitis varies considerably. Affected persons may be asymptomatic or may present with acute hepatitis or features of chronic hepatitis. In the old age group, the disease is usually discovered by abnormalities in liver function tests, or by the manifestation of signs of chronic liver disease on routine examination. In addition, a polyglandular autoimmune syndrome can occur in children with type 2 autoimmune hepatitis. The serum aminotransferases are comparatively higher than the serum alkaline phosphatase and bilirubin. The serum gamma globulins are also high, frequently twice the normal value, particularly IgG. The biochemistry is similar in both types of autoimmune hepatitis. A mild normochromic normocytic anemia with thrombocytopenia and leukopenia is present even before the manifestation of portal hypertension and splenomegaly. The prothrombin time is often high. Anti-nuclear (ANA), anti-smooth muscle antibodies (ASMA), anti-actin antibodies (AAA) and/or soluble liver antigen (anti SLA) are found in type I autoimmune hepatitis. Anti-liver/kidney microsomal antibodies (anti-LKM1) are found in type II autoimmune hepatitis. A lymphoplamocytic mononuclear cell infiltrates, often times with few eosinophils, are present in the portal triads. The infiltrate invades the sharply demarcated hepatocyte boundary (called the limiting plate) surrounding the portal triad and spreads into the surrounding lobule (called the periportal infiltrate) and may spread further. The periportal lesion (also called piecemeal necrosis or interface hepatitis) spares the biliary tree, but may involve more of the lobule. There may also be centrizonal necrosis. Bile duct changes: destructive cholangitis, nondestructive cholangitis and ductopenia may be present on a liver biopsy. An excessive plasma cell infiltrate, rosettes of hepatocytes and multinucleated giant cells may be seen. Fibrosis is present in all except the mildest forms of autoimmune hepatitis. Advanced fibrosis connects portal and central areas. This is called bridging and it eventually causes distortion of the hepatic lobule and the appearance of regenerating nodules, resulting in cirrhosis. Primary sclerosing cholangitis is thought to be an autoimmune disorder in which there is extensive fibrosis of the intrahepatic and extrahepatic bile ducts. To differentiate it from autoimmune hepatitis, a liver biopsy should be performed which commonly would show features involving bile duct paucity, inflammation or periductular fibrosis that are not seen in autoimmune hepatitis. However, sometimes both disorders are indistinguishable on a liver biopsy. Primary biliary cirrhosis is an autoimmune disorder that affects the bile ducts in the portal triads. To differentiate it from autoimmune hepatitis, a liver biopsy should be performed which commonly would show features involving bile duct paucity, inflammation or periductular fibrosis that are not seen in autoimmune hepatitis. However, sometimes both disorders are indistinguishable on a liver biopsy. Antibody tests are also useful to differentiate the two. Usually, in primary biliary cirrhosis, only AMA (antimitrochondrial antibodies) are elevated while, in autoimmune hepatitis, other antibodies along with AMA are elevated. However, there have been rare cases in which AMA is the only autoantibody seen in autoimmune hepatitis. Sometimes a patient may develop features of both autoimmune hepatitis and primary biliary sclerosis OR features of both autoimmune hepatitis and primary sclerosing cholangitis. Such is called overlap syndromes and they are very difficult to differentiate from sole autoimmune hepatitis. Acute hepatitis secondary to hepatitis A, hepatitis B, hepatitis C, hepatitis D, hepatitis E, cytomegalovirus, Epstein Bar virus and herpes virus resembles autoimmune hepatitis. To rule out acute hepatitis C, a PCR (polymerase chain reaction) should be performed to detect hepatitis C RNA since antibodies to hepatitis C develop 6 – 12 months after infection. The nonspecific antibodies seen in some patients with autoimmune hepatitis make it difficult to distinguish autoimmune diseases from chronic hepatitis C. In such a case, a PCR should be performed to confirm hepatitis C. In patients with chronic hepatitis C, a variety of other antibodies like rheumatoid factor and cryoglobulins may be found. The presence of these autoantibodies does not imply the presence of autoimmune liver disease. In rare cases, chronic viral hepatitis and autoimmune hepatitis co-exist. Some patients with chronic hepatitis C have ANA (antinuclear antibodies) or ASMA (anti-smooth muscle antibodies), also seen in autoimmune hepatitis, making it difficult to differentiate the two. In some patients with chronic hepatitis C, ALKM 1 (anti-liver kidney microsomal antibody type 1) is also formed. This antibody is formed against cytochrome P450 2D6 antigen and is also formed in autoimmune hepatitis, so one possible method of determining whether the hepatitis is due to HCV or due to autoimmune hepatitis is that the ALKM 1 antibodies in patients with HCV are directed at different epitopes of cytochrome P450 2D6 from that seen with autoimmune hepatitis. Non-alcoholic steatohepatitis is a disorder in which fatty infiltration of the liver occurs leading to inflammation and fibrosisi of the liver. Diagnosing autoimmune hepatitis in patients with underlying non-alcoholic steatohepatitis may be difficult, especially in the presence of positive ANA. However, in addition to clinical features, the amount of fatty infiltration, presence of polymorphonuclear leukocytes and central fibrosis in the biopsy may point towards non-alcoholic steatohepatitis. Lupoid hepatitis is autoimmune damage to the liver in systemic lupus erythematosus. Autoimmune hepatitis may be associated with a number of autoimmune extrahepatic disorders similar to lupus. Although ANA can be seen in both lupus and autoimmune hepatitis, ASMA and AMA are rare in lupus; therefore, their presence suggests that the patient has autoimmune hepatitis. There is also a form of hepatitis that occurs in systemic lupus erythematosus which is different from autoimmune hepatitis. The pathogenesis of that is related to the presence of anti-ribosomal P protein antibodies. Cryptogenic chronic hepatitis is chronic hepatitis of unknown etiology and is diagnosed after complete workup has been done to exclude all underlying etiologies of hepatitis. It is possible that autoimmune hepatitis may be the cause of some cases of cryptogenic chronic hepatitis in which autoantibodies are absent, or will eventually become detectable. The drugs responsible for liver injury are over 1000 medications and herbal products, the most commonly reported in the United Stated being acetaminophen, followed by antibiotics in which amoxicillin-clavulanate is the most common. 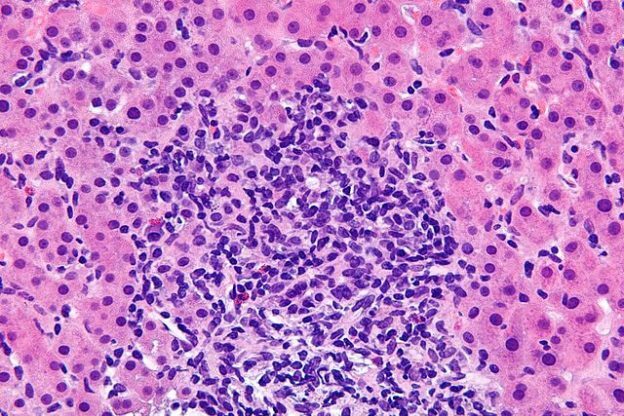 A drug-induced liver disease can be confused with autoimmune hepatitis on histology. However, certain features on histology, like portal neutrophilia seen in drug-induced liver disease, can help differentiate the two. Wilson disease is a disorder of copper metabolism (defective hepatocyte transport of copper into bile and defective incorporation of copper into ceruloplasmin which is the binding protein of copper in blood) leading to copper accumulation and damage to liver and other organs. It usually presents in late childhood and can mimic autoimmune hepatitis in the form of chronic hepatitis or fatty liver disease (a benign condition in which the liver functions normally and looks normal under the microscope except for the accumulations of fat within hepatocytes). Sometimes a raised serum ferritin and increased transferrin saturation is seen in autoimmune hepatitis or chronic viral hepatitis. Significant iron overload in hereditary hemochromatosis (autosomal recessive disorder resulting in unrestricted reabsorption of iron from the small intestine) can be excluded in this setting by the measurement of hepatic iron concentration and HFE gene testing for C282Y mutation. Treatment may not be required in asymptomatic patients with normal or near to normal aminotransferase levels and gamma globulin levels and who have minimal necro-inflammatory activity on liver biopsy since such patients are at a relatively low risk of disease progression. Budesonide has fewer side-effects than prednisolone and is now the preferred treatment. Alternatively, prednisolone 30 mg is given daily for at least 2 weeks, followed by a slow reduction and then a maintenance dose of 10 – 15 mg daily. Azathioprine should be added, 1 – 2 mg/kg daily, as a steroid sparing agent and in some patients as the sole long-term maintenance therapy. Levels of thiopurine methyltransferase should be obtained. Mycophenolate, ciclosporin, and tacrolimus have been used in resistant cases. Steroid and azathioprine therapy induce remission in over 80% of cases. This response forms part of the diagnostic criteria for autoimmune hepatitis. Treatment is lifelong in most cases. Those with initial cirrhosis are more likely to relapse following treatment withdrawal and require indefinite therapy. Liver transplantation is performed if treatment fails, although the disease may recur. Every chronic hepatitis, including autoimmune hepatitis, predisposes the patient to the complications of portal hypertesion, ascites, variceal bleeding, hepatic encephalopathy, and also increases the risk of hepatocellular carcinoma but the risk is less as compared to chronic viral hepatitis. Occasionally, the patients with autoimmune hepatitis may acquire other viral infections, for instance, hepatitis A, B or C. These patients have a more aggressive clinical course and are more difficult to treat since the immunosuppressive therapy for autoimmune hepatitis paradoxically increases the viral replication and liver damage. Kumar, P. J., & Clark, M. L. (2012). Kumar & Clark clinical medicine (8th ed.). Edinburgh: W.B. Saunders.